Freddie Highmore is an English actor who rose to fame for playing Peter Llewelyn Davies in Finding Neverland and Charlie Bucket in Charlie and the Chocolate Factory. He won a People’s Choice Award and three Critics’ Choice Award nomination for his role as Norman Bates in the hit television series Bates Motel. He also earned a Golden Globe Award nomination for Best Actor for his cast as Dr. Shaun Murphy in the ABC drama series The Good Doctor. 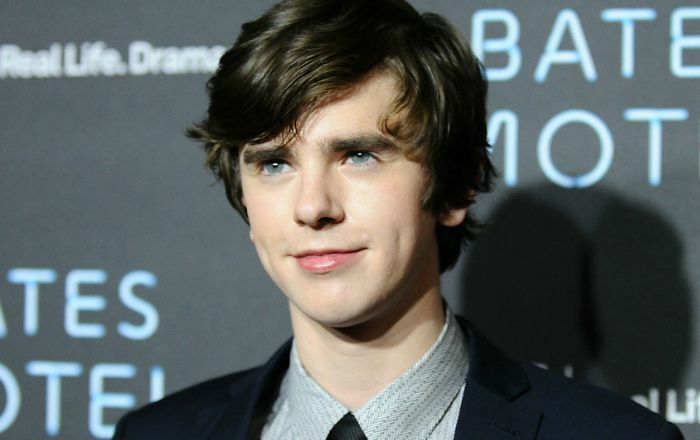 Freddie Highmore was born on February 14, 1992, in Camden Town, London, England, UK. Freddie Highmore went to the Hampstead Garden Suburb, a primary school, and an independent school, Highgate School in North London. He earned his first-class honors in Arabic and Spanish from Emmanuel College at the University of Cambridge. Freddie Highmore has been in a relationship with American actress, Abigail Breslin from 2016. Freddie made his onscreen debut in 1999 in the movie Women Talking Dirty for his role as Sam. As a voice actor, he lent his voice for the character Pantalaimon in the 2007 fantasy adventure film The Golden Compass, based on Northern Lights, the first novel in Philip Pullman’s trilogy His Dark Materials. Highmore earned his first major role as Steven Green in the 2000 television film Happy Birthday Shakespeare. Freddie Highmore gained popularity for his roles as Peter Llewelyn Davies in Finding Neverland (2004), Charlie Bucket in Charlie and the Chocolate Factory (2005), as Norman Bates in the hit television series Bates Motel and Dr. Shaun Murphy in the ABC drama series The Good Doctor. His other major credits include August Rush (2007), The Spiderwick Chronicles (2008), Arthur and the Invisibles (2006), Five Children and It (2004), and The Art of Getting By (2011). Favorite Football Club – Arsenal F.C. His net worth is estimated to be $4.5 million dollars. The majority of his fortune came from his film and television appearances. He began his acting career at the age of seven doing small roles on television. Freddie is a huge fan of soccer. He is a supporter of the Arsenal Football Club. He received several awards and nominations for his role in Finding Neverland, including a Critics’ Choice Movie Award for Best Young Performer, and nominations for the Saturn Award for Best Performance by a Younger Actor and the Screen Actors Guild Award for Outstanding Performance by a Male Actor in a Supporting Role. His father Edward played his father in Hallmark Entertainment’s television film Jack and the Beanstalk: The Real Story in 2001. He was cast alongside Emma Roberts in the romantic comedy-drama The Art of Getting By in 2011. He worked as an intern at Gulf Bank in Kuwait in 2012. He is fluent in Arabic, French, and Spanish, in addition to his native English. Highmore has appeared in a number of video games including Charlie and the Chocolate Factory, The Golden Compass, and Astro Boy: The Video Game. Highmore voiced the character the Duke of Cheshire in the animated film adaptation of The Canterville Ghost.